Yemeni regime forces have attacked anti-government demonstrators in the southern city of Taizz and a village near the capital Sana’a, Press TV reports. On Tuesday, clashes broke out between forces loyal to Yemeni dictator Ali Abdullah Saleh and anti-regime protesters in Taizz and the village of Arhab, located on the northern outskirts of Sana’a. One demonstrator was injured during the turmoil. Yemeni regime forces have continued shelling residential areas in Taizz in the past few days. Anti-regime demonstrations have also been held in Sana’a, the town of Marib near the capital, and several other cities. On Friday, 17 Yemenis, including three women and four children, were killed by tank and mortar fire from regime forces in Taizz. Hundreds of people have been killed and thousands more have been injured in Yemen since the beginning of the popular uprising against the Saleh regime in late January. UN envoy to Yemen Jamal Benomar said on Sunday that the international organization would take all necessary measures to get the country out of its months-long political crisis. Benomar said the UN is intensifying efforts to have “political change” in Yemen. He added that the UN would consider “the positions of the ruling party, a coalition of opposition parties and the youth protesters” in its efforts. Benomar also met Saleh in Sana’a on Sunday to push for a transfer of power. 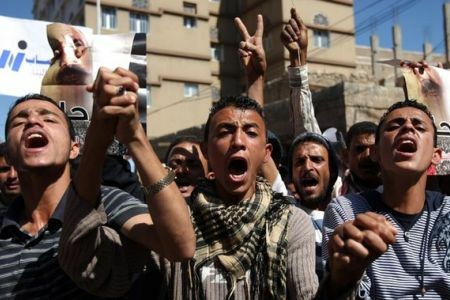 Yemeni demonstrators reject the power transfer deal brokered by the (Persian) Gulf Cooperation Council that offers Saleh immunity from prosecution if he steps down.